PHILADELPHIA -- Bill Cosby's wife called Thursday for a criminal investigation into the suburban Philadelphia prosecutor behind his sexual assault conviction, saying the case that could put the 80-year-old comedian in prison for the rest of his life was "mob justice, not real justice" and a "tragedy" that must be undone. 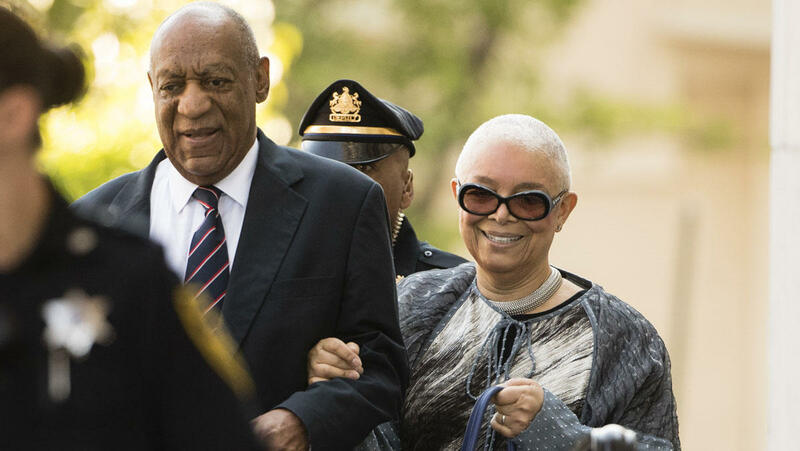 Camille Cosby made her first comments on the verdict in a three-page statement sent to the media through a family spokesman a week after a jury found her husband of 54 years guilty on three counts of aggravated indecent assault. She said chief accuser Andrea Constand was a liar whose testimony about being drugged and molested at Cosby's home in January 2004 was "riddled with innumerable, dishonest contradictions." She echoed Cosby's lawyers, who contended that Constand framed him to score a big payday. Constand's lawyer bristled at the statement and asked, "why would any reputable outlet publish that?" Camille Cosby said her husband's prosecution was politically motivated, repeating his team's contention that he had been a pawn in a heated race for district attorney. Montgomery County District Attorney Kevin Steele attacked opponent Bruce Castor in campaign ads over his decision not to charge Cosby in 2005 and announced Cosby's arrest a month after winning the November 2015 election. She said Steele and his team were "exploitive and corrupt" and that their "primary purpose is to advance themselves professionally and economically at the expense of Mr. Cosby's life." Steele's office did not immediately respond to a message seeking comment. Camille Cosby, 74, stayed away from both of her husband's trials, except for the defense's closing arguments. Before the jury came in last week, she went to the defense table and put her arm around Cosby, who is legally blind. They embraced, smiled and chatted, and he gave her a peck on the cheek. When it was the prosecution's turn to argue, she left the courtroom, and Constand entered. Camille Cosby's statement comes as colleges around the country continue rescinding honorary degrees awarded to the comedian and as the TV academy said it is reviewing his inclusion in its Hall of Fame. Days after Cosby was found guilty, the New York Post's Page Six revealed an intimate look at his reaction to the decision. "This is what they wanted," Cosby said.